We are proud to partner with Four Friends Gallery to present the Femmes Photo Fest Art Crawl. Visit both galleries every Thursday afternoon between now and November 9th to see our unique exhibitions featuring female artists working in photography. Four Friends Gallery's exhibition, L’optique Féminine, is on view now through November 9 and features works from Joyce Wilson, Michelle Magdalena Maddox, Nancy Lehrer, Makenzie Goodman and Lindsey Ross. Four Friends Gallery is open Tuesday & Thursdays between 1:30 PM and 5:30 PM. 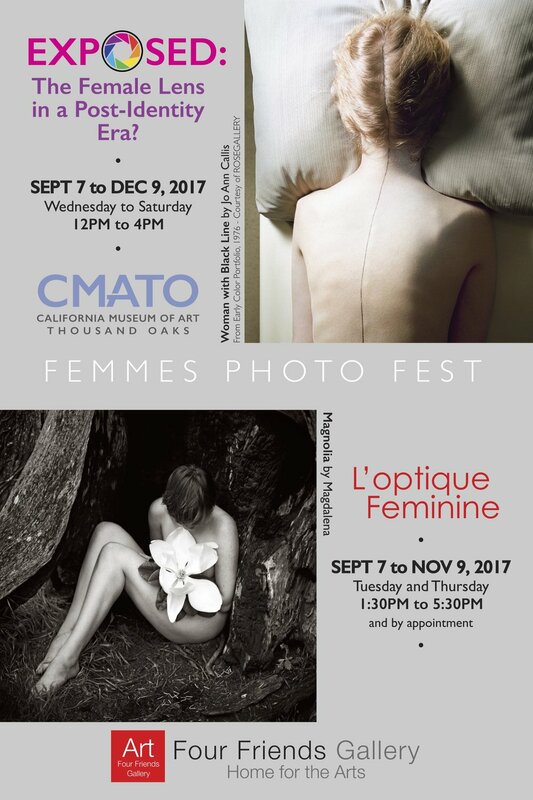 CMATO's exhibition, Exposed: The Female Lens in a Post-Identity Era? is on view now through December 9 and features works from Jo Ann Callis, Sant Khalsa, Sandra Klein, Andréanne Michon, Gay Ribisi and Arden Surdam. CMATO is open Wednesday through Saturday between 12 PM and 4 PM. Four Friends Gallery and CMATO are located less than a half mile from each other on Thousand Oaks Blvd.